Aptus Front Access Battery Racks have been engineered and developed with front access (1-year battery rack) that incorporates a spill containment solution at no added cost. This feature is designed to comply with authorities having jurisdiction and enforcement personnel who may require this feature. The containment trays can be applied during new installation or as a retrofit solution. 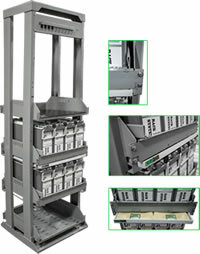 These racks are modular in design and accept all major manufacturers’ 10 year batteries. Containment can be added at a later date at a marginal cost. This allows the end user more flexibility and will reduce cost of compliance if required.